I have just launched a project to try to contact as many other churches dedicated to St Peter and St Paul in time for our Patronal Festival on June 27th. 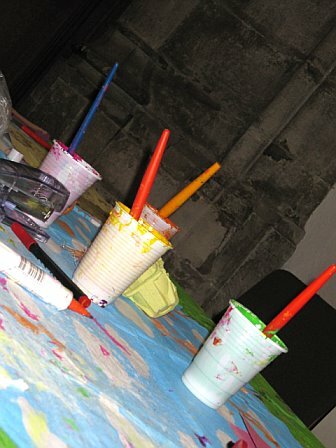 Our young people helped me to put a blog together (which is why it is bright pink and luminous green....!) and I have included some of their comments about the church on the page "About us". 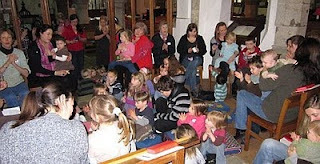 As you will see, we already have a few comments from other churches, and I am hoping we will get many more. I'm planning to print them out, with a map showing where the churches are, and pray for our sister churches during the Patronal Festival service. If you know of any churches dedicated to St Peter and St Paul - not one or the other, but both jointly - please let me know, and, if I can, I'll contact them (It would be better to do this through me, to avoid churches being bombarded by emails!). PLEASE NOTE, I have already contacted all the other St Peter and Paul's in Rochester Diocese (there are 17, including ourselves) so please don't send me links to them! I wonder how far our greetings will travel, and what we will discover of the great diversity of the people of God in the next couple of months. 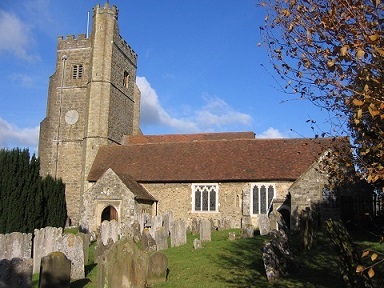 Churches Together in Sevenoaks and District have organised an Election Hustings, where all the candidates for Sevenoaks will speak and answer questions. It will be at St John's United Reformed Church on Sunday May 2nd at 8pm. Anyone is welcome. If you have a question you would like to submit to the candidates for them to answer on the day, you can do so via the Churches Together website. Sir, — While I sympathise with Shirley Chaplin’s distress at being required to remove her crucifix by her employer (News, 9 April), her resistance is fundamentally mis­placed and very far from a genuine upholding of Christian faith. I wonder how sound her teachers and advisers are. Jesus is absolutely clear in the Gospels: Christians are to be known for their loving and self-denying service, not their religious zeal, and this is how the world will know they are God’s children. We are warned that not everyone who says “Lord, Lord” will enter the Kingdom, but those who do the true will of God (Matthew 7.21). Hence, Christians will go the extra mile and turn the other cheek (Matthew 5.39, 41). They find no need for outward forms of piety, but pray in secret (Matthew 6.5, 6). They are taught that the greatest among them are those who are willing to be the slaves of all (Mark 9.35). Jesus went on to be the greatest example of this teaching in his death on the Cross. Moreover, he revealed such loving, self-denying service as the true character of God, revolutionising worldly ideas of the Divine. When Jesus calls his followers to take up their cross, this is what he means (Mark 8.34). Christians are called to make an exhibition of their faith, not by their fervent religiosity (like the Pharisees), nor simply by personal loyalty to Jesus, but by the quality of their loving, self-denying service. In the wider context of the marginalisation of Christians in the UK (real or supposed), this is a perspective of fundamental importance. Christians are called to serve God’s world in the particular way of Jesus, which is the true way of God, rather than simply promoting themselves or their faith communities in his name. Other religions may find particular clothing or symbols or privileges to be of vital importance. But Christians are called to a different way, and to trust God for the outcome; for this is the Easter promise. We were delighted to be baptising Reuben this morning. He slept through most of the service, only waking up when the water hit his head (and not for long then!). 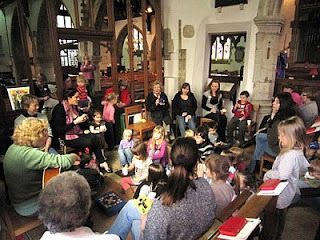 The rest of the congregation seemed to manage to stay awake, however, and we sang, lit candles, and celebrated. 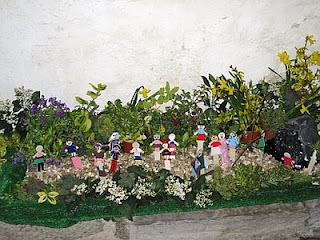 Here are some photos of the church decorated for Easter. Thank you to the band of flower arrangers who came along yesterday to do such good work. A quick gear change transformed the church into a still oasis of reflection (no chance of that when the children were there!) with various focuses for prayer around the building, most of which will stay up through the Easter weekend. These included an invitation to think about what you saw when you looked in the mirror, and how you felt about it; Jesus' death and resurrection held up a mirror to those around him making them see themselves more clearly or in different ways. 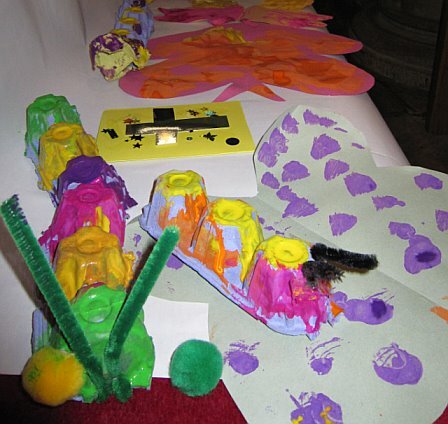 Then there was a display which explored caterpillars and butterflies, symbols of transformation and resurrection; what changes do we need to see in ourselves and our world? Material linked to the story of the penitent thief helped us things about the things we have done wrong and how we deal with them. This also included prayer requests from young men in Rochester Young Offenders Institute, gathered for us by their chaplain. Finally there was a display inviting us to think about tears, those we shed and those we are unable to shed, why we shed them and God's response to them. These displays were enhanced by contributions from the children in the morning, some of which you can see in the pictures.